In attendance were Fernand, Robert, John L., Joe , Eric, Tom, John O., Peter, and Bruce. 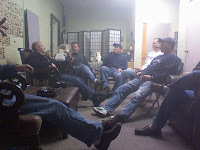 As usual, we gathered to enjoy a good cigar and give our opinion on it by holding a 'group tasting' following dinner. The nine of us dined at nearby Saltoro in Shoreline, where steaks and burgers were ordered all around. The great food was paired with wine, Scotch and a couple martinis, before heading over to John’s place to begin the tasting session and enjoy some much needed relaxation and camaraderie. Our selection for this Herf was the Padron 6000 (natural). A sharp-tipped torpedo measuring 5 1/2 inches long with a ring guage of 52. This Padron was Cigar of the Week back on October 13th which received a 91 from Cigar Aficionado's expert tasting panel. Following CA's 4-part rating system (Appearance & Construction, Flavor, Smoking Characteristics, and Overall Impression) we began the tasting. 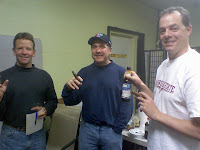 This proved to be a very well-liked cigar among our group of tasters. After averaging our scores, The Cohiba Club's official rating for the Padron 6000 (Natural) Torpedo is 89. An excellent cigar. Made by the Padron family in Nicaragua, this cigar’s wrapper had a consistent, yet robust look to it, indicative of solid craftsmanship. The roll quality was a display in art with a beautifully executed taper complimenting a moderate firmness throughout. All but one of these cigars drew freely (a couple actually drew too freely) while one had a plug. Everyone quickly commented on how relatively mild this cigar seemed in comparison to some of our previous herf selections. Adequate amounts of smoke were produced and the ashes were mostly stable and rather light in color. The burn on our samples was mostly quite even, though a couple did require re-lights toward the end. The flavors were pleasant, but not particularly inspiring. A basic ‘tobacco’ flavor was predominate for most of us. There was perhaps a bit of wood in there, with a smooth and easy finish that was somewhat on the dry side. Everyone agreed on it starting out mild and progressing to no more than medium strength and body. All in all, a very enjoyable cigar which we highly recommend. See you at the next herf, December 7th.